By this time, you have probably washed out the last grains ofsand from your ears and abandoned your first couple of newyears resolutions.At least the guy with the yellow hair has not pressed the redbutton yet so there is still hope for us all in 2018.Before we start dreaming about what lies ahead for 2018 it might be worth looking back at what happened in financial markets in 2017, understand how to interpret it and determine what it says, if anything, about what we can expect from 2018. 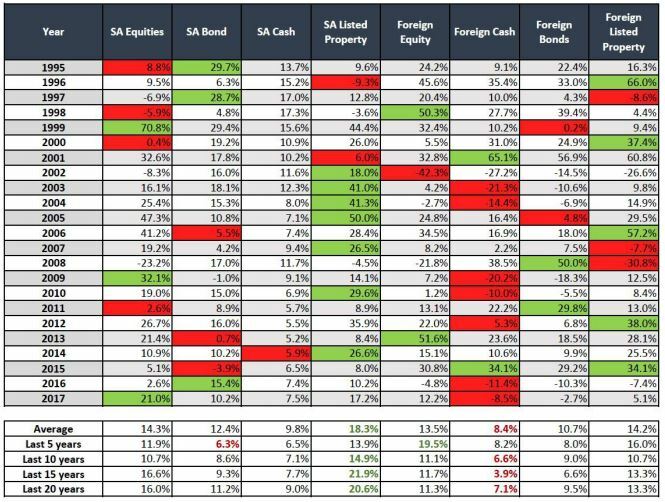 From the table above, we can see that SA equities achieved a return of 21% for the past year while foreign cash (dollars) gave you a negative return of nearly -10%. Besides the 2017 numbers there is a lot more data that I feel needs some more explanation. 1. The 21% return from SA equities should be taken with a pinch of salt. I want to go out on a limb and say that there are very few well-constructed portfolios that would have achieved this return in 2017 simply because the return of 21% is mainly due to the performance of Naspers and its high weighting in the index. 2. The figures in the matrix are a harsh reminder that sentiment driven investment decisions almost always lead to bad outcomes. Think back to when Zuma’s full-blown state capture started with the axing of Nene for van Rooyen. That was back in December 2015.If you took your money out of the country at that point, the following 2 years would have been tough, unless you were 100% invested in offshore equity. Also notice what happened to the rand converted return on dollar investments in the first few years of Mr. Mandela’s presidency (1996 – 2000). Despite maximum optimism about the country’s future at that stage, the rand weakened considerably more compared to the last 5 years of utmost pessimism. If nothing else, this tells us that trying to time or predict future exchange rate movements or to make investment decisions based on the current political climate may not be the best way to spend your time. 3. Local listed property was still the best performing asset class over the last 23 years by a large margin. It not only delivered this return with ease but also with the least amount of volatility of all the growth assets. Other asset classes will have a hard time playing catch-up in the coming 5 years, but investors would do well to remember that the future might not (or in this case probably WILL not) look like the history. 4. Over the last 5 years offshore assets outperformed their local counterparts effortlessly with offshore equity delivering 19.5% p.a. vs SA equity 11.9% p.a. which was the largest performance gap. If we were to take Naspers out of the equation this difference will be even bigger. It does raise the question whether the “take everything offshore” message shouldn’t be properly qualified first. Even though the exchange rate, at current levels, might be in your favour, American equities are trading at an alltime high and I reckon rebalancing of portfolios should be done carefully. 5. Offshore cash (dollar) is the Land Rover Discovery of investment vehicles. You will not only have the bumpiest ride but also arrive at your destination last. It is (except for the last 5 years) the worst performing asset class of all asset classes over all measured time periods above. Make no mistake, there are years like 2001 and 2015 where you would have given your front teeth to have your entire portfolio in dollar cash but over the long term it is probably best to avoid it. Also, the correlation between offshore cash and offshore bonds is 94% which means that exposure to both these asset classes in your portfolio might feel like diversification but it’s not. 6. I often hear people say that they are looking for someone to actively look at and manage their portfolio’s and make adjustments when they anticipate or see something happening. the average return for the 2 strategies since 1996 would have been 10.73% p.a. and 10.58% p.a. respectively. You would have done worse than if you simply adopted a buy and hold strategy for 7 of the 8 asset classes over the period. Do not make the mistake of confusing activity with added value. To chase returns or to throw money at something JUST because it went down a lot did not work over the past 23 years. I would be surprised if it worked over the next 23. News flow and media can lead us to focus on the wrong things. Steinhoff’s problems are tragic and of importance to all involved but the impact of this on the public was considerably smaller than the impact of your choice of asset allocation for 2017. However, the emotion that was stirred up in pensioners about their exposure to Steinhoff is in my opinion disproportional to its effects. If you could turn back time to the beginning of last year and you were given the choice to invest 100% in American Dollars (the so-called safe haven) or 100% in the JSE (with the Steinhoff drama) which would you choose? Always try to keep perspective when confronted with dramatic news and ask someone to put these numbers in context before becoming overly anxious or start to make investment decisions based on the news.